The TRMC Cardiac Catheterization Lab opened in August of 2016. This state-of-the-science facility allows Titus Regional to offer several cardiac services and procedures to the communities we serve. Cardiac catheterization (also called a cath) is a minimally invasive procedure. During the procedure, a tiny catheter is guided into the heart, usually through a blood vessel in the leg or arm. Once inside the heart, it can be used to diagnose a problem or to treat a problem. By gaining access to the beating heart, cardiac catheters allow a physician to check the internal blood pressure of the heart, assess blood supply, view the coronary arteries on the surface of the heart and check the level of oxygen in the blood. It is also used to evaluate the pumping chambers and to assess valvular function. Cardiac catheterization is one of the most accurate tests in the diagnosis of coronary artery disease, and over a million of them are performed each year. 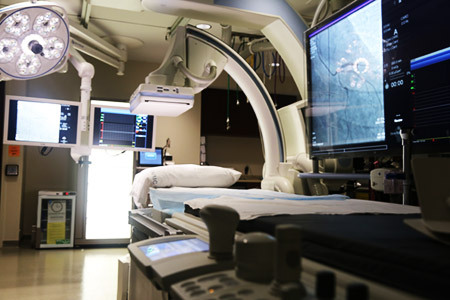 During cardiac catheterization, the physician tracks the course of the catheter by watching it on a fluoroscope, an x-ray machine that displays the catheter and blood vessels in real time on a screen. A variety of measurements may be performed when the catheter is in place. Once the catheter is removed, patients are given 6 hours of recovery time, and most patients are free to go home. Results are often available within a matter of hours.